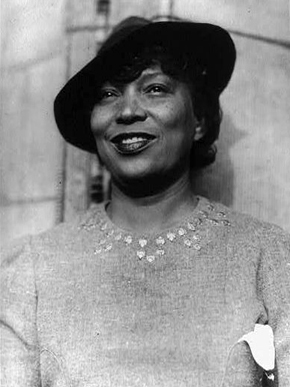 On June 8, 2015, Zora Neale Hurston will be one of twelve writers taken into the newly established Alabama Writers Hall of Fame. Over the years I have admired much of Hurston’s work and taught the novel Their Eyes Were Watching God but had not read Valerie Boyd’s highly acclaimed biography, Wrapped in Rainbows: The Life of Zora Neale Hurston (Scribner, 2003). It was time to learn more about Hurston, a larger than life, nearly mythological figure, whose simple biographical facts were in doubt or dispute. Hurston had written an autobiography, Dust Tracks on a Road, but had chosen to leave out or alter information she did not think everyone needed to know. For example, at 27 Hurston claimed to be 17, so she could go to public high school. She got away with it. In Dust Tracks, Hurston declares herself born in Eatonville, Florida, and indeed that was her childhood home and spiritual home, and the setting for her best book Their Eyes Were Watching God, but she is included among Alabama writers because she was born in Notasulga on January 7, 1891, daughter to a handsome, charismatic preacher, John Hurston, who moved the family to Eatonville when Zora was barely a toddler. Hurston as an individual was of course amazingly intelligent. She would take a BA and then most of a PhD under Franz Boas, the father of modern anthropology, at Columbia University and do groundbreaking sociological/anthropological research. Funded by grants, Hurston, travelling alone by car through the South and armed with a pistol, collected folklore, songs and stories, dances and potions, in lumber camps and turpentine camps in Florida, often with considerable personal danger. She travelled to the Caribbean and wrote about folklife and customs in Jamaica and Haiti and became an expert, nearly a priestess, of hoodoo, receiving a lot of training in New Orleans. One of her research trips took her to Mobile in 1927 to interview Cudjo Lewis, known as “The Last Slave.” Lewis, in his eighties, had been brought over on the Clotilde, the last slave ship, and could remember life in Africa. When not on a research field trip, Hurston was usually in New York, for a long time a treasured member of the Harlem Renaissance. From the twenty-first-century vantage point, it is difficult to feel what a vibrant artistic place Harlem was in the 1920s. Music and dance were thriving at spots like the Cotton Club, but writers and thinkers such as W.E.B. DuBois, Alain Locke, James Weldon Johnson, Wallace Thurman, and Langston Hughes were publishing poetry, editing magazines, often of protest, and staging theatrical productions. Hurston was in the thick of it. A side note in Boyd’s biography but very important at the time were the “Negrotarians,” rich white people like Charlotte Mann, Fanny Hurst, and Carl Van Vechten, who supported the black artists financially. The financial support was important, naturally, but sometimes Hurston chafed at being directed by her patrons on what to research, what to write, and what to publish. She also got crosswise with some of the leading lights of the time, such as DuBois, who insisted that all black writing and black theatre be social protest writing, in essence propaganda to advance the cause. As with integration, Hurston had her own opinions and felt that her people were and should be portrayed as joyful and fulfilled just as often as downtrodden and oppressed. Although communism was appealing in its aim of a fairer distribution of wealth, Hurston, unlike such writers as Richard Wright, was too much of an individualist to get in deep. In the last years of her life, Hurston was mostly alone, living in Florida. Although she had published seven volumes of work and had been, arguably, a famous author, her books were out of print. To get by, Hurston worked for a while as a maid. She wrote, “I like to cook and clean house. Why shouldn’t I do it for somebody else for a while? A writer has to stop writing every now and then and just live a little.” This caused an uproar, but she was not “particularly embarrassed.” Towards the end, she was broke and applied for welfare shortly before her death in 1960. Hurston, who was largely forgotten, was rediscovered when Alice Walker, in August 1973, visited her grave in Fort Pierce, Florida. Walker found the unmarked plot, had a headstone installed, and wrote up her experience for Ms. Magazine in 1975. From that moment forward, Hurston has had her rightful place in American letters. Her books were reissued—sales of Their Eyes Were Watching God have passed one million—and several posthumous volumes published. Hurston is on the syllabi of many college courses and will not be forgotten again. Zora Neale Hurston was one of the only women writers in the Harlem Renaissance, but what a woman! Talented, uninhibited, energetic, physically brave, she was novelist, playwright, and social scientist. A passionate woman, once in a while she would marry, Boyd tells us, but she was not cut out for domestic life and would soon hit the road again, to collect a folksong, write a novel, or just go see the world.